(Updated at 6:30 p.m.) Rosslyn’s Central Place will soon be welcoming another restaurant option to the neighborhood. Nando’s, a South-African/Portuguese chicken restaurant, is coming to 1800 N. Lynn Street. It is currently expected to open in March, we’re told. 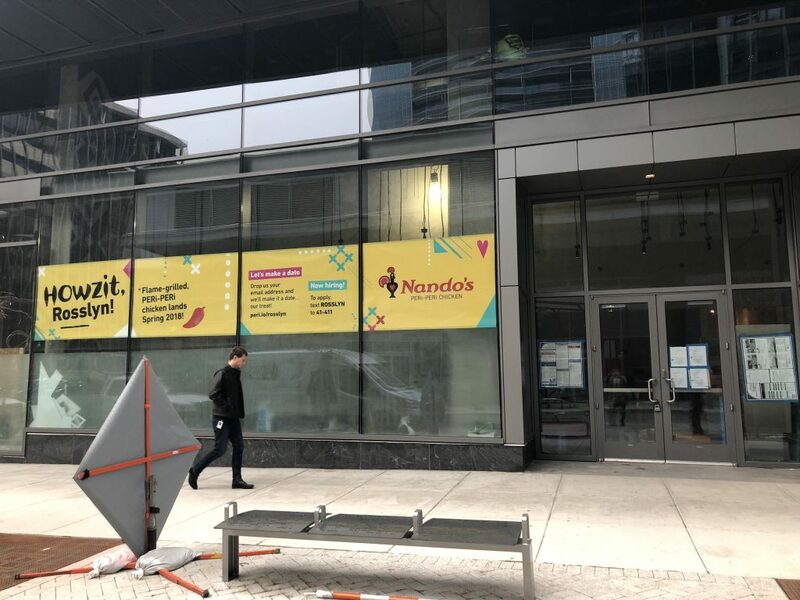 There are already two Nando’s locations in Arlington: one at Pentagon Row and another a recently-opened Ballston location. The chain, originally from Johannesburg, South Africa, is most well-known for its peri-peri sauce, a chili-based, lemony sauce. Nando’s is hiring 35 positions in both the front and back of the house, according to the location’s general manager, Jorge Lemus. A number of restaurants opened last year as part of the Central Place development, including Little Beet, Sweetgreen and a new McDonald’s. Elsewhere in Rosslyn, Poke Bar and Bibimix are expected to open in the next few months.